The Metals Reserve Company was one of eight subsidiary companies set up during WW II by the Reconstruction Finance Corporation, an independent agency of the United States government that was established by Congress in 1932. Like the other seven subsidiary companies, Metals Reserve Company was chartered with the objective of stimulating development of alternative sources of essential and strategic materials during the war. Fluorspar is the term used for ore that contains commercial quantities of the mineral Fluorite, which has the chemical composition of Calcium Fluoride, CaF2. Fluorite has a hardness of 4; a specific gravity of 3.18; and belongs to the Isometric crystal system, commonly occurring in nature as cubic and octahedron crystals. The mineral is vitreous or glassy in appearance, may be clear but is generally translucent, and comes in a wide variety of colors, most commonly light green, yellow, bluish-green and purple. Fluorspar ore is categorized into three grades based on the percentage of calcium fluoride content: Metallurgical grade, 60-85%; Ceramic grade, 85-95%; and Acid grade (97%). The largest volume of fluorspar goes into metallurgical usage. Because of its essential use in the manufacture of steel and aluminum, fluorspar was classified as a Strategic Ore Mineral during WW II. 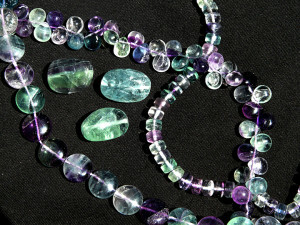 Approximately 8 to 10 pounds of fluorspar is used in the open-hearth process to make one ton of steel, in which the fluorspar functions to make the slag more fluid, and to desulfurize the molten metal. In the manufacture of aluminum, fluorspar is used to make hydrofluoric acid, HF, an essential ingredient in the manufacturing process. Hydrofluoric acid was also used extensively during the war in the manufacture of catalytic compounds used in the refining of petroleum products to make gasoline. Ceramic grade fluorspar is used in the manufacture of glass, enamels and cooking utensils. In recent years fluorite has found a growing niche market in jewelry and stone carving. With the completion of the Gila Fluorspar Mill in 1943, and the availability of a dependable local market for the raw, unprocessed fluorspar ore, the objectives of the Metals Reserve Company were realized. Mining of fluorspar from the existing local deposits increased dramatically, along with extensive prospecting and identification of additional potential deposits in the surrounding area. The Gila Fluorspar Mill was located just east of where Bear Creek crosses NM 211 just south of the village of Gila. From its startup through the end of the war, the Gila Mill bought, stockpiled and processed approximately 50,000 tons of fluorspar ore, all of which was mined from a number of small deposits discovered, prospected, and subsequently claimed within the Gila National Forest by mostly local residents of Gila and Cliff area. 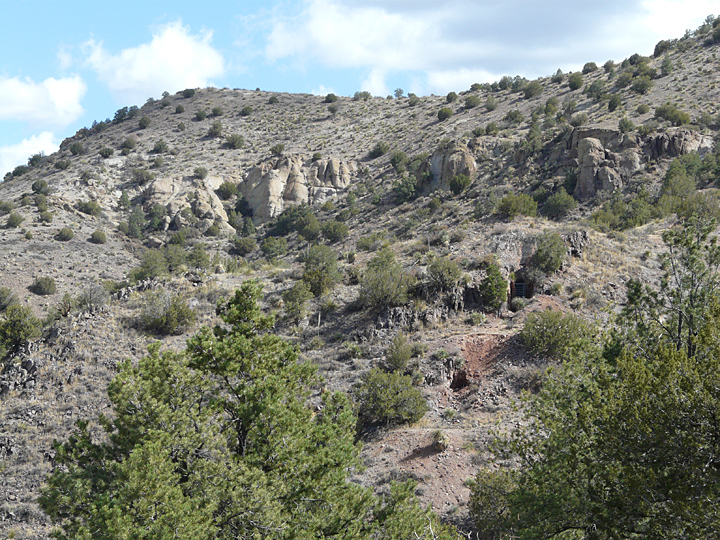 While prospecting was extensive in the area and numerous new claims were recorded, only three mines yielded significant tonnage that was processed at the Gila Mill: the Clum Mines, the Foster Mine and the Victoria Mine. Combined production from these three mines in 1944 was about 50 tons per day, with most of it coming from the Clum Mines. The processing capacity at the mill was about 14 tons an hour, 15-1/2 hours a day, 6 days a week, or about 5,400 tons a month, producing about 95 to 100 tons a day of metallurgical grade concentrate averaging 85% calcium fluoride. 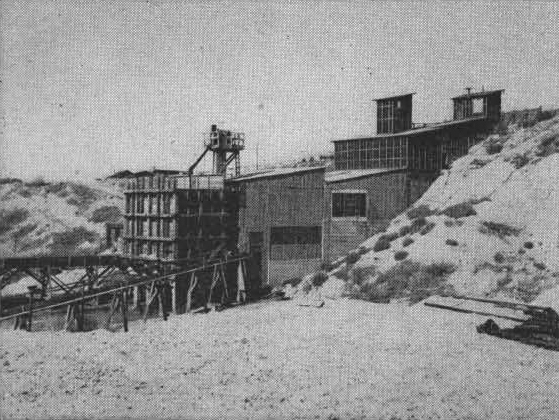 Most of this ore concentrate was then shipped to the Colorado Fuel and Iron Company steel mill in Pueblo, Colorado. Using a figure of roughly 50% recovery of 85% grade concentrate from the raw ore processed at the Gila Mill, and considering that most of the concentrate was used in the manufacture of steel, it is interesting to consider that mill concentrate derived from the Gila Fluorspar deposits would have contributed the production of up to 5 million tons of steel for the war effort! 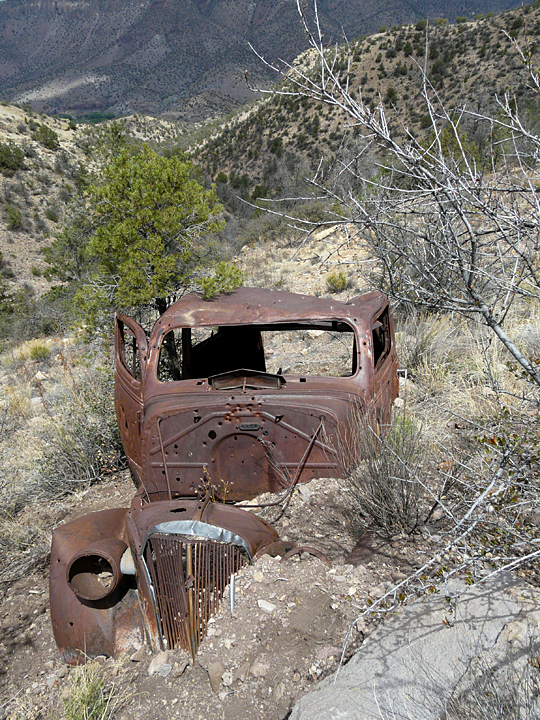 After the end of WW II, fluorspar mining in the Gila District gradually ceased, except for a brief period in the early 1970s, when the demand and price of hydrofluoric acid for domestic use once more stimulated fluorspar mining in the area. 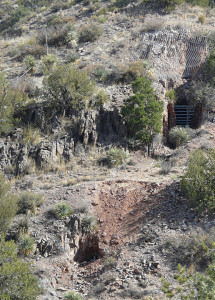 Today, all of the mines, prospects, and claims within the Gila Fluorspar District are long abandoned, with the land ownership belonging to the Gila National Forest. Like so many of the numerous small mines that flourished in this area in times past, these mines and prospects are mostly forgotten and rarely visited except for the occasional rockhound or hiker. 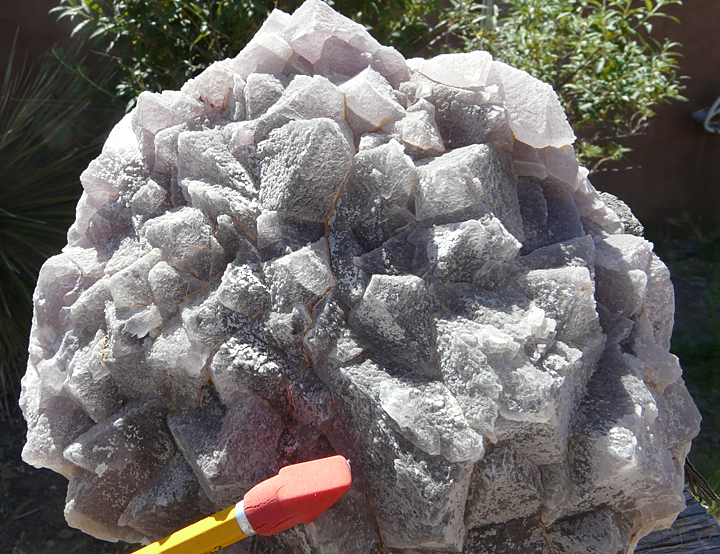 Both novice as well as serious rockhounds will find the Gila Fluorspar District a real treat to visit, providing an excellent opportunity to find some nice specimens and crystals of fluorite. For those who enjoy hiking, coupled with an interest in exploring and history, the area offers hikes for all capabilities and interests. These hiking opportunities range from short, easy walks along old roads with spectacular views of the Gila Wilderness, to challenging, off-trail, cross-country trekking in extremely rugged, pristine terrain for the experienced and properly-equipped outdoor enthusiast. 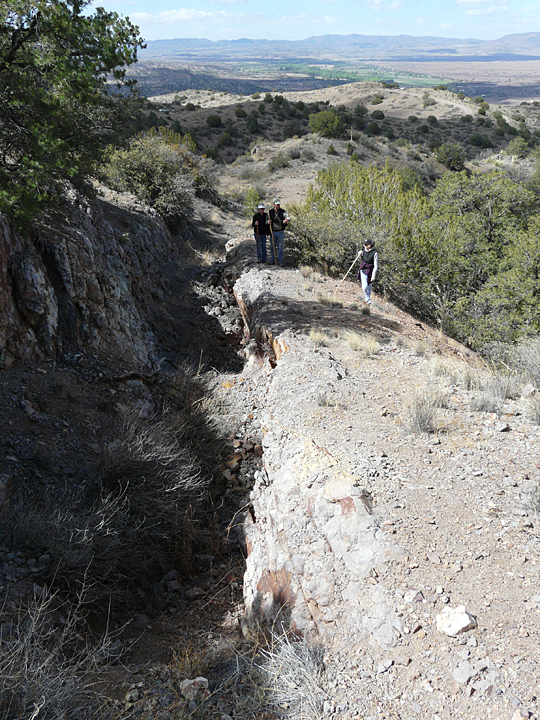 Hiking an old mining road in the Gila Fluorspar District, overlooking the Gila Wilderness. What stories it could tell! 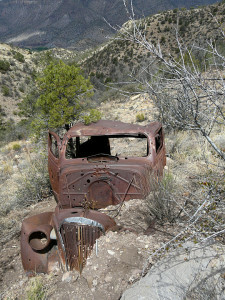 A 1936 Chevrolet sedan in permanent rest just off an old mine road in the Gila Fluorspar District. While the most intensive mining, prospecting, and production in the Gila Fluorspar District occurred during the World War II period, the initial mining in the District began some 60 years earlier with the discovery and subsequent development of two deposits now known as the Foster Mine and the Clum Mines in the 1880s. 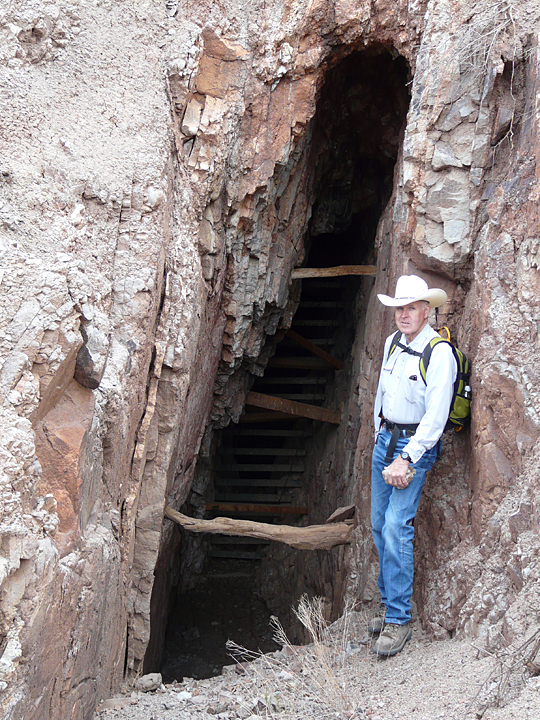 The Foster Mine began operation in the early 1880s and is considered either the oldest or second oldest fluorspar mine in New Mexico, the other contender being the the Burro Chief Mine in the Burro Mountains, 15 miles to the southwest. Little is known about the Foster Mine other than it was operated by Apoloinario Ogas and Pedro Carajal, who, like the operators of the Burro Chief Mine, sold their production to the silver and lead smelters in Silver City, 30 miles to the east. In those days Silver City was the classic booming, thriving mining town of the Old West, serving a never-ending flood of miners, merchants, and settlers that were pouring into the area on a daily basis, hoping to capitalize on the riches of silver, gold, copper and other minerals coming out of the mountains surrounding the town. In these heady, early days of mining and processing, few production records were kept, however it is reported that the Clum Mine was also producing fluorspar in the Gila District about a mile east of the Foster Mine about 1885. 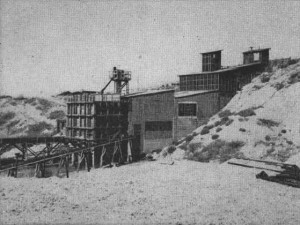 Production from both the Foster and Clum mines continued into the early 1900s with both mines supplying fluorspar to the war effort during World War I and into the 1930s, and then reaching their peak production during World War II. Apparently the Foster Mine was not worked after the late 1940s, but the Clum Mines did reopen for a brief time during the 1970s. Eventually, increasing production at the Foster and Clum Mines lead to the construction of a primitive road into the Gila Fluorspar District to facilitate operations and haulage of the raw ore out of the area. Significant improvements to the road were made during the 1930s and 1940s and in the decades that followed. Today this road is known as Turkey Creek Road and Forest Road 155, a primitive but usually passable forest road that extends some nine miles into the Gila National Forest from the Gila Valley at the end of State Road 153 to terminate at the Gila River, about 3 miles downstream from the Gila Wilderness. The road is maintained by the County on a semi-regular basis, and except for brief periods during the Monsoon Season (late June/early July until early September) provides good access into this magnificent part of the Gila National Forest for hiking, rockhounding, fishing, hunting, and camping. In recent years most of the roughest spots on the road have been upgraded so that while high clearance is still advisable for vehicles, four-wheel drive is not necessary. Close-up of the two open drifts at the Foster Mine, sealed off with steel grating. Looking northeast, parallel to the fluorspar vein at the Foster Mine, showing two old drift workings. 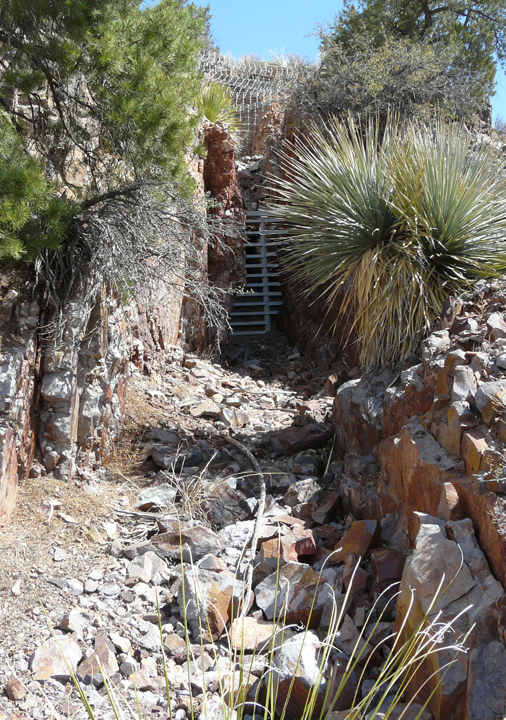 The Foster Mine is located a short distance off Turkey Creek Road and makes for an interesting day’s outing for hiking and rockhounding in spectacular surroundings. The mine is reached by a short hike along the old mine access road and affords the visitor the opportunity to search fluorite crystals and colorful specimens of fluorspar ore, as well as to examine the workings of a typical small mining operation. 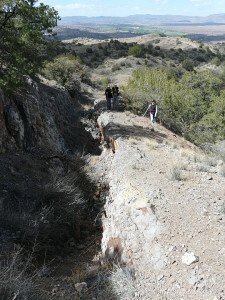 The old workings of the mine are extensive, stretching about a quarter of a mile along a NE to SW trending nearly-vertical fissure vein of fluorspar, averaging 3-4 feet in width, that is exposed at the surface along a southwest sloping ridge line that drops down into E-W trending gulch. 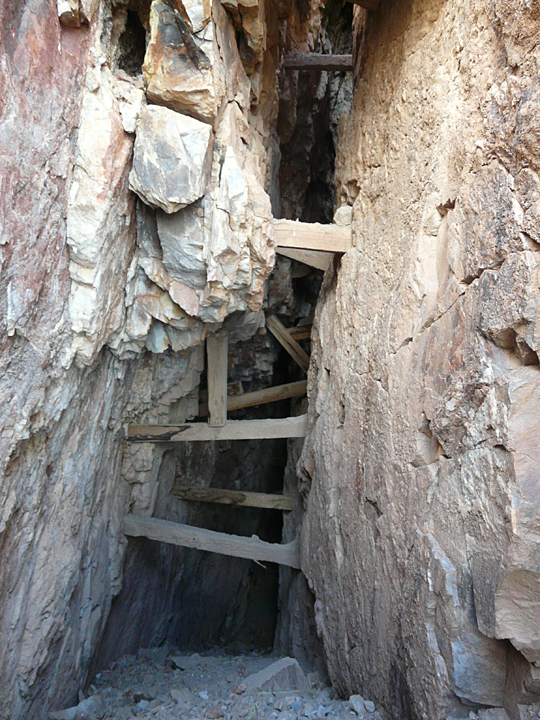 Looking parallel to vein at Foster Mine with close-up of open drift in foreground that has been sealed off with steel grating, and stope in background that was mined to the surface and now covered with steel mesh. Looking southwest along trench cut into vein at Foster Mine, from which fluorspar was mined. Several types of mining were employed at the Foster Mine including: the blasting of a primary adit (a horizontal tunnel driven into the mountain side to provide access to an ore body) into the vein at the bottom of the gulch, followed by overhead stoping (the mining of an ore body underground creating an open space or rooms); the blasting of several short drifts, (a horizontal tunnel driven into the mountainside following an ore body), coupled with stoping; the sinking of several shafts, (the excavating of a vertical tunnel from the surface, from which horizontal workings are made into the ore body) coupled with stoping; and several open trenches at the surface following the vein. Stoped portion of near-vertical vein at Foster Mine. 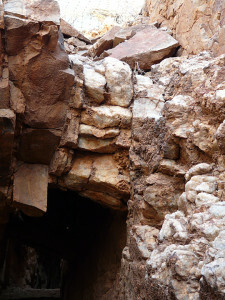 Photo taken through steel grating showing timber “stulls” used to keep sidewalls of stope from collapsing after ore is removed. Width of stoped veins at Foster Mine averages 3.5 feet. Another stope at Foster Mine showing stulls and steel grating behind. Note varying width of vein from 3 to 5 feet. Most of the host rock in which the fluorite veins occur is a fine-grained volcanic lava flow rock which contains less than 5% quartz, a predominant mixture of alkali and plagioclase feldspar, and a small percentage of iron and magnesium rich silicate minerals such as biotite, hornblende, and pyroxene. In technical terms, the rock would be called an alkali-feldspar rich latite. The host rock is considered to be Early Oligocene in age and was probably ejected from the Mogollon Caldera eruption some 34 million years ago. 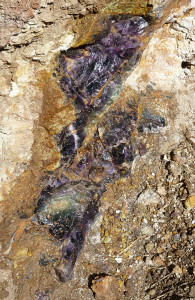 The fluorite veins occur within a normal fault which took place millions of years after the host rock was deposited. The time of faulting and emplacement of the veins themselves is probably related to either the eruption or subsequent collapse of the Bursum Caldera, which occurred roughly 28 and 17 million years ago. Vein of fluorspar (whitish rock) left at top of stope where vein reaches surface at Foster Mine. Here at Casitas de Gila Guesthouses, we are quite familiar with hiking and rockhounding opportunities in the Gila Fluorspar District area. We are happy to provide guests staying at the Casitas with detailed directions and maps for this fascinating area, as well as for all the hikes detailed in the Casitas de Gila Nature Blog and on our website. All one needs to do is ask! Crystals of purple Fluorite in small vein in an old prospect trench within the Gila Fluorspar District. This entry was posted in fluorite, geology, history, mining, rockhounding and tagged geology, mining history, rockhounding. Bookmark the permalink.